Two of my favourite kinds of fairies have to be both Moon and Water. I like Moon fairies because I feel that they are associated with “guiding lights at night” – whilst at the same time being “just out of reach”. I like Water fairies because they are associated with “ripples of fun” – whilst at the same time being “just a wave ahead”. 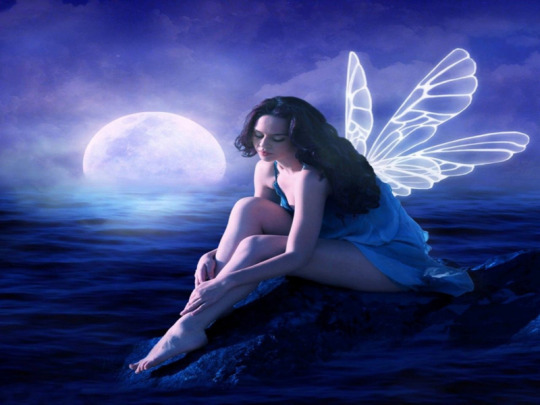 So, what of a Fairy that is both Moon and Water? Could this Fairy sit upon the rocks? I believe she could, but not like a Mermaid. She would instead, be sitting at rest – thinking of the “starless skies” and the “mists upon the sea”. In starless skies, would you find “kingdoms of the blue”. In mists upon the sea, would you find “glowing of the mystic”. Could this Fairy muse upon the sea? I believe she could, but not like a Sailor. She would instead, be one with the sea – knowing just where the “ripples lay” and the “tides of this time”. In ripples lay, would you find “a quest of moonlight”. In tides of this time, would you find the “pull of the moon”. Could this Fairy glow with Moonlight? I believe she could, but not like a Moonbeam. She would instead, be a butterfly of light – knowing just where the “turns be taken” and the “flutter this night”. In turns be taken, would you find the “arcs of fairytale”. In flutter this night, would you find the sound of “fairy godmother”. Could this Fairy think of you? I believe she could, but not like a Tooth Fairy. She would instead, be sat upon the rocks, musing by the sea, glowing in the moonlight – connecting stepping stones, of guiding light, with just-a-twist of moonlit fun: the “Sirens of the Sea”. This entry was posted in Fantasy Fairy Art and tagged butterflies, fairies, fairy, fantasy, full moon, moonlight, night. Bookmark the permalink.